Two Goshen College faculty members will be stepping into new leadership positions beginning July 1. 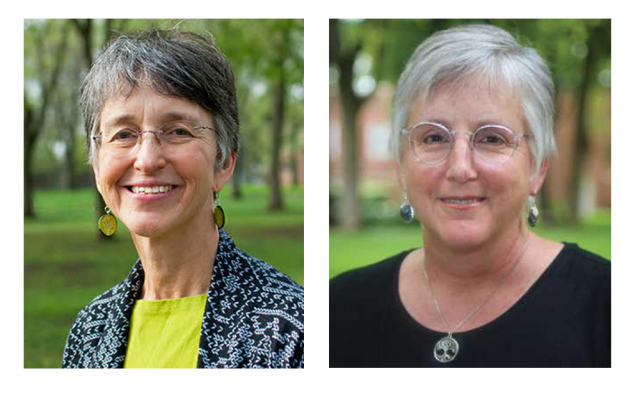 Beth Martin Birky will transition to the position of associate dean; Jan Bender Shetler will transition to director of international education. Birky, who currently is serving as Title IX deputy coordinator, is a 1983 GC graduate and holds a master’s degree from Arizona State University and a doctorate from Loyola University Chicago. She has served in numerous roles on campus since 1993. Most recently, Birky has taught English along with women and gender studies classes and served as English department chair and WGS director. Previously, she held a variety of administrative positions such as writing center director, general education director, humanities division co-chair to academic affairs, faculty chair, interim associate academic dean and faculty advocate. In her new position, Birky will support and represent Ann Vendrely, vice president of academic affairs and academic dean. Birky will also serve as representative for major scholarship agencies and as a member of the crisis management team for the college. The role will put her in charge of student issues such as academic dishonesty cases, student grievances, readmissions petitions, academic advisor for interdisciplinary students and coordinator for undergraduate research and grants. Birky demonstrates a deep understanding of Goshen culture and history, according to those involved in the interview process. “Beth was selected for her experience in administration, systems thinking and commitment to serving students and faculty,” said Vendrely. Birky says she wants students and faculty to know that Goshen College is concerned with learning on all levels, and she is eager to be part of the broad learning experience. “Ideally, I would like people to see me, both colleagues and students, as a resource for their learning and teaching experiences,” Birky said. Coming in with more than 14 years of experience living abroad, Shetler, currently a professor of history, will be responsible for all aspects of GC’s international education programs. She will replace Tom Meyers, who will retire after 15 years in that role. She graduated from Goshen College in 1978 and holds a master’s degree and doctorate from the University of Florida. She has lived, worked and studied in Tanzania, Ethiopia and the Congo and has led several Study-Service Term units to Ethiopia, Tanzania and Senegal. Her research in oral tradition and social identity connects to her own commitment to the outcomes of global education. Shetler served as coordinator for the September SST search conference that facilitated discussion regarding the future of GC’s international education program. She says this role was an honor and knows so many people are working to improve this 50-year-old program. “It is incredible to step into the position of Director of International Education to have all this work already underway and so many good ideas percolating across campus,” Shetler said. Kristin Troyer works as the layout editor at The Record. She is a senior public relations major, with minors in Bible & religion and graphic design. Bylines include Hesston College Horizon, Mennonite Disaster Service’s Behind the Hammer, Hesston College Today, Goshen College Bulletin, and more. Formerly, Kristin worked as executive editor, layout editor and staff writer at The Record. Follow Kristin on Twitter @kristin_tr and email her at ktroyer@goshen.edu.